If I could make only one kind of cookie for Christmas, this would be the one *everyone* would ask for. Add flour to creamed mixture and mix until well blended. This makes a very soft tender dough. It should be chilled for a few hours before rolling. Remember that adding more flour and doing more mixing makes dough tougher. I roll this out on a floured counter and cut it using floured cutters (just dip them in flour between cutting each cookie). 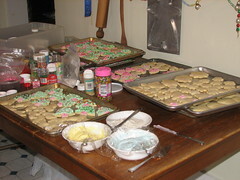 I save all the leftovers till I’m done, then knead them smooth (knead as little as possible), then cut more cookies. Bake at 350*F for 10 minutes. This makes a lot of cookies. I actually double it for Christmas and never have enough! They go fast! Mix till smooth. Tint with paste or gel food coloring. 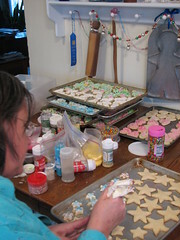 This sets quickly so add sprinkles as soon as the cookie is decorated. 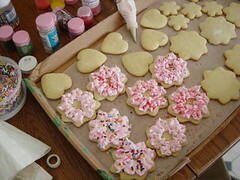 I use cake decorating tips to decorate the cookies. A leaf tip makes great Christmas trees, holly leaves, and wreaths. This entry was written by ~~Rhonda, posted on December 3, 2007 at 10:40 pm, filed under cookies, Recipes and tagged Christmas, cookies, open house, recipe, sour cream sugar cookies. Bookmark the permalink. Follow any comments here with the RSS feed for this post. Post a comment or leave a trackback: Trackback URL. 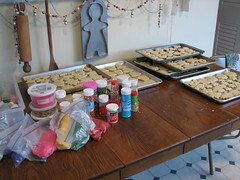 Hi Rhonda, I’ve made the dough ~ is it best to go ahead and make the cookies now and freeze them for Christmas or keep the dough frozen awhile. BTW I noticed you didn’t mention if this recipe freezes well. Uh-oh. Help! Thanks in advance, annie h.